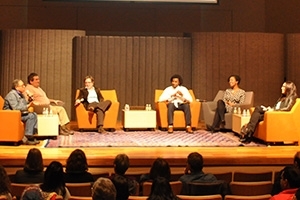 Six College of Arts and Sciences faculty members spoke to a packed and enthusiastic audience last week about how they have personally experienced the effects of race, class, dis/ability, gender, and sexual identity. More than 100 people attended The You That You Create event at the Katzen Arts Center’s Abramson Family Recital Hall. Faculty speakers included Kyle Dargan (literature), Caleen Jennings (performing arts), Marc Medwin (performing arts), Celine-Marie Pascale (sociology), Theresa Runstedtler (history), and Kathryn Walters-Conte (biology). Faculty members shared formative moments in their lives, using the lens of identity, difference, and power. Following the faculty discussion, audience members asked—and tweeted—questions. They also shared stories about their own lives. The event was sponsored by College of Arts and Sciences Dean’s Office.